Click on small thumbnail images to enlarge and view full door hanger image. 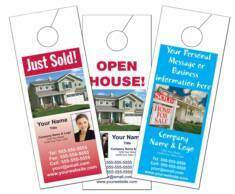 Let us get you "on the door and in the door" with our door hangers. These are a low-cost, direct method for reaching your specific target. Jumbo Door Hangers 4¼" x 11"
5 Sizes to Choose From! Great for higher volume orders 1000 min. Imprint area is - 3.75" x 9"
• Door hangers have a 1/4" white gripper on all 4 sides of the pad. • No bleeds on door hangers. (Note: Setup charge applies for any order if cancelled) *FREE Setup is for returning customers only, and that have done door hangers in the last 12 months from order date.